I had very little time since we are still traveling. But what may look like little to some means a lot to me, because I made time, however little, to do something artwise and it is important to me to actually make it through the whole month doing some art each day and posting. I sometimes have trouble with follow through so I am so excited that I am going to make it through the month (unless all connections to the Internet crashes)! I like the difference the color makes to the design I posted yesterday. I thought I had my watercolor pencils with me, but when I pulled them out they were just regular colored pencils and I didn't have time to finish coloring the whole thing, yet. I enjoyed your PATTERN so much that I linked to it! I collect pictures for Art Docents to illustrate important art techniques and concepts. Our group is mostly parent volunteers working in elementary school classrooms in Alameda, CA. I am happy that you are enjoying Art Every Day Month, and expressing yourself through the means of Art. Susie, good for you for following through! I think doing that is so good for one's self-esteem. Size does not matter, nor does material or subject matter. It matters that you created and that it a beautiful thing. The colors bring a whole new level to the design. I really like this drawing, both black+white and color. it looks lovely - I've discovered this month it is all about the process not the product. Thank you for the comment. I love this design! -- I can see things in it too, such as peacock feathers at the top left. 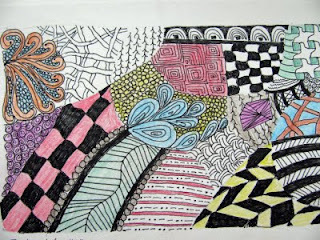 Love the zentangles, and they look nice in colour, too. I like how you added color to the Zentangle. I drew an ATC sized one while we traveled on Thanksgiving & thought about coloring it with my Prismacolor pencils I had with me. Now that I see what you've done, I'll probably go for it.